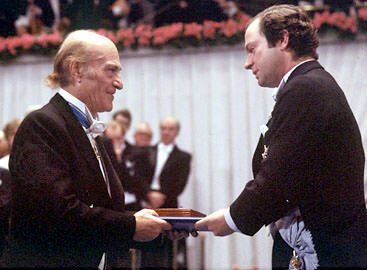 Odysseas Elytis (2 November, 1911 – 18 March, 1996) was a Greek poet and a 1979 Nobel Prize laureate. Born in Heraklion, on the island of Crete, Mr. Elytis was a descendant of an old industrial family from Lesbos, the Alepoudelis. The poet’s family moved the Athens where he finished high-school and graduated from the University of Athens. Early on he changed his last name to disassociate his writings from the famous family’s soap opera. The French surrealist poet Paul Éluard was an early influence. His first poem was published in the journal New Letters (Νέα Γράμματα) in 1935. During World War II he served as a Second Lieutenant at the Headquarters of the 1st Army Corps and then at the 24th Regiment, on the front lines. When Nazi Germany occupied Greece (1941), the poet fought against the Italians in Albania. During that time, his 1945 poem Heroic and Elegiac Song for the Lost Second Lieutenant of the Albanian Campaign (Asma hērōiko kai penthimo gia ton chameno anthypolochago tēs Alvanias) became an anthem to the cause of freedom. The poet was the Program Director of the Greek National Radio Foundation in 1945-1946 and again during 1953-1954. The poet lived in Paris, France during 1948-1952 and 1969-1972 where he met many famous artists including Matisse, Picasso, and Chagall. The poet borrowed elements from Ancient Greece.